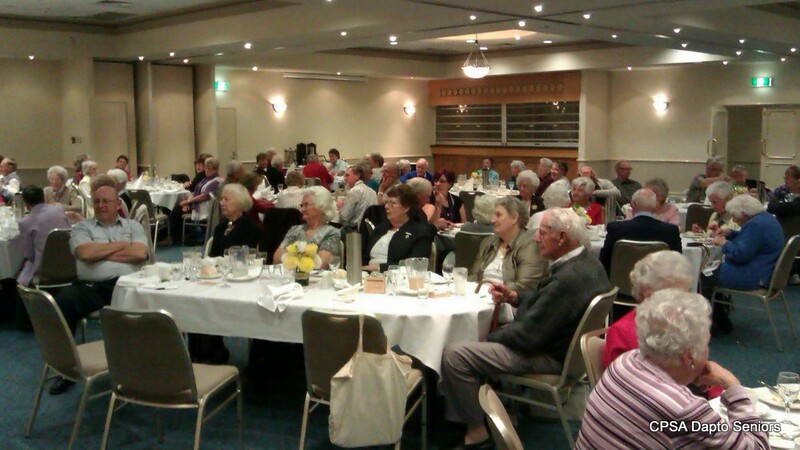 Dapto Seniors' 50th Anniversary Birthday Lunch was a great success. Held at Dapto Leagues Club exactly 50 years to the day after the granting of the club's charter the lunch was organised, as always, by our Assistant Secretary who ensured that the event ran smoothly. Not only that... the food was excellent and the raffle was magnificent. 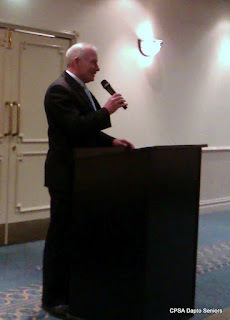 Over 100 members attended. His Worship, the Lord Mayor of Wollongong, Gordon Bradbery joined the members and entertained us with a most amusing speech about some of the pitfalls of being a minister and a politician. Mr Bradbery earlier spent some considerable time mingling with members. One member was awarded branch life membership for her tireless service to the club over more than 20 years. Such an active member is an inspiration to us all and, after the short presentation ceremony, she was asked to cut the beautiful birthday cake. The birthday lunch turned out to be a very fitting occasion to celebrate our 50th Anniversary, something the committee hopes members will remember for some time to come. Every member who attended this very special lunch received a gold envelope containing souvenirs of the event including a commemorative pen and a copy of the original charter.